Long ago, on a cold winter night, our ancestors made a bonfire in front of their cave and sat around with their neighbors, sharing stories and staying warm. Someone started humming and making sounds, then a few joined in by drumming on a hollow wood. A few enthusiasts let their bodies sway and feet move with those sounds. They lost themselves in the symphony of beatboxing rhythms, feet kicking the ground till the stars began to disappear. They felt a euphoric sensation in their hearts. It was the first festival celebration on our planet. Gathering together is etched into our DNA; it fulfills our need for a sense of community, self-expression, and self-expansion. Gatherings allow us to bring pieces of our lives and contribute them to the whole. From the dawn of our species, we have been gathering to celebrate seasonal changes, celestial events and honor the dead. Since then, these gatherings have evolved and expanded into religious, cultural, national and musical festivals. Festivals are the living history of our world intertwined with human experience. They give us a great opportunity to be a part of something larger and see how we fit into that big picture. They allow us to express ourselves against the backdrop of others, to live out loud, and to explore beyond the boundaries of everyday life. We can have a lifetime’s worth of experiences during a three-day festival. I have put together an ultimate guide to the best and unique festivals from around the world to fill up your travel calendar. Each one of them offers a unique experience of art, music and world culture. Find the one(s) which you may like to include in your 2018 travel plans. I will eagerly wait for your stories and favorite photos of the festival(s)! Carnevale di Venezia, as with carnivals around the world, takes place in the days leading up to Lent. According to tradition, Venice’s Carnival got its start in 1162, when townspeople celebrated a victory over the Patriarch of Aquileia. The festival was outlawed entirely in 1797 and the use of masks became strictly forbidden under the rule of the Holy Roman Emperor and later King of Austria, Francis II. In 1979, as an effort to bring back the history and culture of Venice, Italian Government revived the traditional Carnival. In the present time, Carnevale di Venezia is an explosion of color and fashion creativity, an experience you’ll never forget. Its narrow, enigmatic backstreets and the St. Mark’s Square bustle with extravagant parades and mysteriously masked revelers for two weeks. While many events—particularly the opulent masquerade balls—require invitations and have steep ticket prices, many others, like the candle-lit parade of boats, concerts, and street performances, are free and open to the public. In 1950, high school students expressed their creativity by building few snow statues in Odori Park and founded the Sapporo Snow Festival. Over the years, it has developed into a big, commercialized event, featuring spectacular snow and ice sculptures and drawing more than two million visitors from Japan and across the world. The Snow Festival is staged on three sites: the Odori Site, Susukino Site, and Tsu Dome Site. Odori Site – This is the main site and is centrally located 1.5 kilometers long Odori Park. The festival’s famous and large snow sculptures are exhibited there. They are lit up daily until 10:00 pm. Sapporo TV Tower offers a great view of the park and has an entrance fee. Susukino Site – Susukino is located only one subway stop south of Odori Park and exhibits about one hundred ice sculptures. The ice sculptures are lit up daily until 11:00 pm and until 10:00 pm on the festival’s final day. Tsu Dome Site – It is a family oriented site with three types of snow slides, snow rafting, and more snow sculptures. Inside the dome, there are many food stands and a stage for events. The Tsu Dome Site is open daily from 9:00 to 5:00 pm. It opens a few days before the full start of the festival. During last century, in northeast China, local peasants and fishermen used ice lanterns for light while they work during winter time. Over the time, these ice lanterns started attracting tourists and locals started ice/snow sculpture competitions as well as other winter activities. The first official Harbin Ice Festival was held in 1985 and it was merged with Heilongjiang International Ski Festival in 2001 and got its new formal name China Harbin International Ice and Snow Sculpture Festival. Today, it is perhaps the largest ice and snow festival in the world. It showcases beautiful ice sculpture of all sizes from small mythical creatures to awe-inspiring 250-feet monuments along with traditional ice lanterns. Hola Mohalla is a festival celebrated annually by Sikhs all over the world. Celebration at Anandpur Sahib is the largest and rooted in more than three-century old tradition. In 1701, Guru Gobind Singh, the tenth Sikh guru, started a new tradition by overseeing a day of mock battles and poetry contests at Lohgarh Fort. The objective was to train Nihangs (the fearless soldiers of the armed order) in the traditional martial arts and to ensure they were always battle-ready against the hostile Mughal empire. Nihangs constitute an order of Sikhs who, abandoning the fear of death, are ever ready for martyrdom and remain unsullied by worldly possessions. Hola Mohalla is a journey back in three centuries when battles were won by sheer strength and courage of men and animals. It is a festival to showcase and celebrate the military fervor of the Nihangs. Today over a million visitors gather to witness some of the best horse stunts, sword fighting, and mock battles. All the events are free and open to the public. You are welcome to enjoy all your meals at langar (free kitchen), which is an integral part of the Sikh institution (Gurdwara). It was first held in 2000 at the French resort of Risoul as an après-ski nightclub promotional exercise. The Tyrolean resort has been hosting the festival from 2005 which has evolved from a DJ and electronic dance music-themed event to its present format. It combines winter sports (primarily snowboarding) with on-piste and après-ski music performances and themed parties in unusual locations, such as a forest clearing, a traditional remote alpine farmstead, an igloo village, and an open-air street party. It has grown to become the biggest snow and music festival in the mountains of Europe. Enjoy watching pros snowboarder in the park by day and dance to the tunes of an eclectic mix of music by night. This unique festival of ideas and music gets its name from Leonard Cohen’s song “There is a crack in everything…that’s how the light gets in”. It is the world’s largest philosophy and music festival, hosted by a non-profit, Institute of Art and Ideas with the mission to get philosophy out of the academy and into people’s lives. It is perhaps the only festival where you can invigorate your intellect by the day and indulge in music, dance, and parties by the night. The theme for 2018 is “Darkness, Authority, and Dreams”. An impressive list of speakers includes physicist Lawrence Krauss, political theorist Noam Chomsky, psychiatrist David Nutt, former Archbishop of Canterbury Rowan Williams, film director Sophie Fiennes, and journalists Polly Toynbee, Gideon Rachman and many more. Here you can join a debate with the world’s top scientists, laugh with the UK’s best comedians, dance to the finest beats, enjoy the circus show, participate in a masked ball, watch finest documentaries, relax at a spa and calm yourself with yoga. The White Nights Festival is a public gala of cultural events organized by the Saint Petersburg City Administration. It is a near two-month-long calendar of ballet, opera and classical music performances and concerts held at Mariinsky Theatre, the Conservatoire and the Hermitage Theatre. The overnight opening of some of St. Petersburg’s most prestigious museums and art galleries is an exciting event, known as the Long Night of the Museums. The best part is free entry to those museums. Another highlight is the Scarlet Sails show – on the Neva River a boat with red sails crosses the water, wishing graduates a smooth voyage into adulthood. A series of carnivals take place across the city, where actors perform re-enactments in period costume besides contemporary shows. Check for the Long Night of the Museums when you start planning to participate in this festival. This is one festival which has the power to transform lives through hypnotizing Sufi music. Renowned artists from around the world flock to Morocco’s spiritual capital to enthrall their audience. Over nine days audience get an exposure to a variety of Sufi music, from Moroccan Sufi chants, Pakistani qawwali incantations, and Egyptian madhi odes, to flamenco-style Christian saeta, ancient Indian Gwalior chants, and Turkish whirling dervishes. Musicians from France to Rajasthan find common ground, with collaborative performances culminating the program and celebrate this festival of sacred music. This is where you will be drenched in music which will keep vibrating in your soul forever. The origin of Naadam festival is as old as Mongolia itself. Activities such as military parades and three core sporting competitions – archery, horse riding, and wrestling have been a part of Mongolian life from the 13th century. It later served as a way to train soldiers for battle. Naadam begins with an elaborate introduction ceremony featuring dancers, athletes, horse riders, and musicians. After the ceremony, the competitions begin. Three manly sports – the wrestling, horseracing, and archery at the core of the festival. Genghis Khan’s nine horse tails, representing the nine tribes of the Mongols, are ceremonially transported from Sukhbaatar Square to the Stadium to open the Naadam festivities. Over the year, playing games using sheep anklebones “shagai” has become popular. Shagai has a dual purpose – a game piece and token of divination and friendship. This is one of its kind festivals to experience the nomadic spirit of Mongolia. The Garma Festival is held in Gulkula, where the Yolngu ancestor Ganbulabula introduced the yiḏaki (didjeridu or didgeridoo) to the Gumatj people. The yiḏaki is specific to the Yolngu people who now refer it as mandapul, out of respect for a deceased Manggalili-clan man whose name sounds similar to yiḏaki. This festival is a celebration of the cultural inheritance of the Yolngu people. It is an effort to preserve traditional arts and rituals – bunggul (dance), manikay (singing), miny’ tji (clan designs) and wangga (music and ceremony). It is also a bridge between indigenous and non-indigenous Australians. The festival is organized by the not-for-profit Aboriginal Yothu Yindi Foundation and aims to share the knowledge and culture of the Yolngu with non-indigenous Australians. It includes cultural workshops showcasing traditional practices of Yolngu culture, musical performances, film program and exhibition stalls. It also offers visits to the local community and schools. Larry Harvey, Jerry James and a group of friends met on Baker Beach in San Francisco on the summer solstice of 1986. They burned a 9-foot wooden man as well as a smaller wooden dog as a spontaneous act of “radical self-expression”. In 1988, Larry Harvey formally named the summer solstice ritual “Burning Man. In 1990, it moved to its present location and since 2014 it is organized by the Burning Man Project, a non-profit organization. It is described as an experiment in community and art, influenced by ten main principles: “radical” inclusion, self-reliance, and self-expression, as well as community cooperation, civic responsibility, gifting, decommodification, participation, immediacy, and leaving no trace. Participation is a key precept for the community – selfless giving of one’s unique talents for the enjoyment of all is encouraged and actively reinforced. Some of these generous outpourings of creativity can include experimental and interactive sculpture, building, performance, and art cars among other media. The symbolic ritual burning of a large wooden effigy (“the Man”) traditionally occurs on the Saturday evening of the event. The Oktoberfest is an important part of Bavarian culture, having been held since the year 1810. The Munich Oktoberfest originally took place in the 16-day period leading up to the first Sunday in October. In 1994, this longstanding schedule was modified in response to German reunification. This one is the mother of all Oktoberfest, attended by more than 6 million people from around the world every year. Besides consuming an insane amount of beer visitors also enjoy a wide variety of traditional food, music and folk dances. The first Fiesta was a gathering of 13 balloons in 1972 to celebrate the 50th birthday of 770 KOB Radio Station. The next year Albuquerque hosted the first World Hot-Air Balloon Championships and it became an international event. Today it is the largest balloon convention in the world and attracts almost 600 balloons and 1000 pilots. Don’t miss the chance to experience this one-of-a-kind event packed with many unusual and fun events. Every event day starts with a breathtaking sight of many hundreds of balloons lifting off into the morning sky and ends with the balloons of every color, shape, and size flickering like giant psychedelic light bulbs against the dark sky. Gas Balloon Race is the premier gas ballooning event in the United States. Pushkar is a small temple city of about 15,000 inhabitants. It swells to more than ten times during Pushkar Mela, with around 50,000 camels, this is the largest camel fair in the world. The fair is focused on trading of camels and horses for first four days. By fifth day atmosphere becomes festive with shows, dance, music and fun competitions, which continues to grow until the eighth day. The last day of the fair is relatively calm with local farmers and performers participate in an ancient ritual of a holy dip in Pushkar lake. They seek the blessing of Brahma (the creator god of Hindus) in the 2000 years old Brahma temple before heading back to their homes. During the four days of festivity, there is so much to experience – tribal dance, gypsy music, camel dances, camel races, mustache competition, Rajasthani food, and shopping for beautiful jewelry and paintings. You may let loose your adventurous spirit and participate in competitions – turban tying, tug of war, cricket match, kite flying and many more. Amsterdam Light Festival is the best festival to experience young, innovative and sensory art form – the Light Art. It offers a stage to light artists from all over the world who push their own boundaries. Spectacular exhibitions throughout the city center and along its picturesque canals will illuminate the dark winter months. The land exposition will take place at the Marineterrein Amsterdam. It is freely accessible from 5:00 pm until 10:00 pm daily (except new year’s eve). The water exposition will light up the canals of Amsterdam and can be enjoyed by boat tours. The light art installations will be illuminated daily, from 5:00 pm until 11:00 pm. The festival also hosts artists talks, performances and readings at the Marineterrein Amsterdam. The connecting theme will be ‘The Medium is the Message’. What a way to ring in the new year! Add more to your celebration of life this year by participating in these unique experiences and happy travels! Wow. I want to attend all these festivals. Each one looks amazing! Especially the white nights in St. Petersburg and snowbombing festivals. I’ve never been to any of these festivals but your post makes me want to attend them all! I’d especially love to see the Balloon and Ice & Sculpture Festival, they look amazing! Oh my gosh, Carnavale in Venice has intrigued me for years! I’ve always wanted to go to a masquerade ball, so I’ll just have to make my way over there one of these years! Wow, your list actually got me excited to go to some of these places! I’ve heard of the Sapporo Snow Festival and I definitely want to go to that someday. The Snowbombing Festival in Austria looks super fun too! (Can you tell, I’m into snow! haha!) And for music, the one in Morocco is definitely on my list now. Glad you like the post. How about Harbin? I have heard the ice lanterns look magical at night. I will definitely be going to Fez some day. Happy travels! I live in India but £’d never heard of the Hola mohalla! Sounds so interesting! Although, I’ve heard of the Pushkar fair, I’ve never visited it. Can’t wait to visit someday! This is a really good list! I didn’t know there’s such a thing as an ice lantern! And I kinda would like to go to the Fez music one. Thanks! I MEANT NOW*** on my list hahaha sorry!! couldn’t figure out how to edit my comment! I love this post! I blog a lot about festivals too, but usually music/transformational ones (Like Burning Man!) I didn’t know about a lot of these cultural festies, but they’re not on my list… I’ll def share this post with my audience! Timing is the hard time, right? Don’t forget to share your photos when you attend any of these festivals. 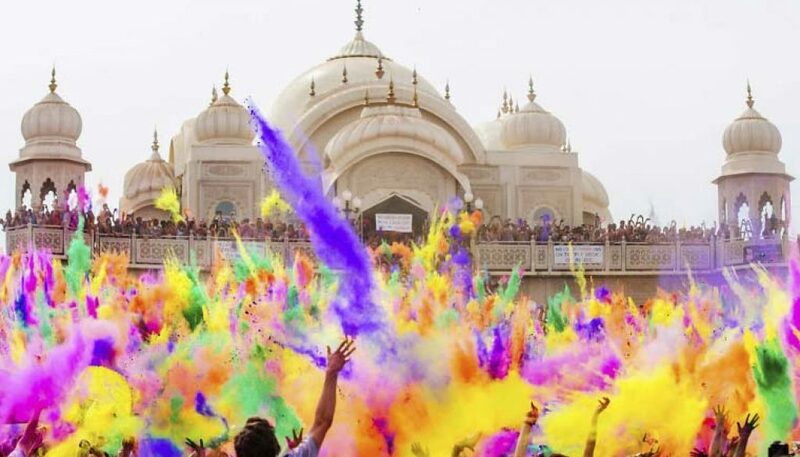 What an interesting listing of varied festivals from around the world. Those ice laterns in China are wonderful, and I enjoyed learning a bit of their history. I’m also drawn to the festival in Mongolia with the displays of great horse and rider skills. Naadam is on top of my list besides Hola Mohalla and Harbin ice festival.